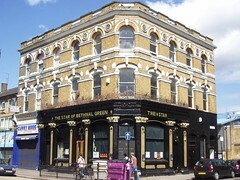 A pub and venue on Bethnal Green Road, most recently known as the Pleasure Unit. It has been refurbished since its previous incarnation, the Star has its eye on the live music and clubbing crowd that increasingly make up the residents of what is increasingly an eastern extension of Shoreditch. Complementing the slick black exterior is a stripped-down space inside, with a small raised area to the left of the entrance and a bar at the back of the room. There is another, smaller, bar upstairs with three draught taps for lager, and a smaller selection of spirits. Tables and sofas surround the top of the stairs, packed too closely around the bar, having the effect of creating a long queue. A good range of familiar up-market lagers grace the bar, though Ewan did not get a chance to check the availability of ale (possibly only bottled). It has a late licence for the club nights it hosts, and looks to be a good venue for these, though it easily gets packed. Last visited by Ewan and others, 24 January 2009. Last edited 2009-04-21 18:28:14 (version 3; diff). List all versions. Page last edited 2009-04-21 18:28:14 (version 3).